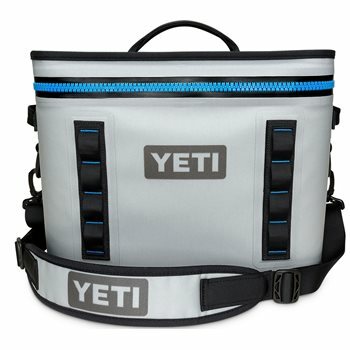 Free YETI Ice 2lb with Select Coolers. Add any 2 select items to your order and promotion will be applied. The weekend is young, so grab the YETI Hopper Flip 18 and head for the hills. The bigger build suits your larger hauls and longer expeditions. Hopper Flip 18 is durable, leakproof and versatile with the Hitchpoint Grid for tools and accessories. The Hopper Flip features Coldcell Insulation that uses rubber foam for cold-holding and a Dryhide Shell that is resistant to water, mildew, punctures and UV rays. Additional features include a Wide-mouth Opening for easy access and a Hydrolok Zipper that is leakproof and waterproof.